Most diamonds are not cut for beauty they are cut for weight retention; this translates into huge differences in the beauty and value of the diamonds. If the facet structure is not aligned properly, a significant amount of light can be lost through the bottom of the diamond and not reflected back to your eye. Two diamonds may have the same weight, color and clarity grade, but if they are cut differently, it can attribute for the 45% difference in price. In the diamond market today, 95% of diamonds are cut for weight retention only. Most of the diamonds are cut deeply which actually makes them look smaller for the same given weight. Many jewelers will even present their diamonds as "Ideal cut" without the proper qualifications. Jewelers use these terms because they know they can make more profit by selling a poorly proportioned diamond as an ideal diamond; this allows up to 45% more profit into the jewelers pocket and out of yours. This is one of the main reasons stores will not show you many diamonds side by side of equal weight. You will easily see that there are drastic differences between their similarly rated "ideal cuts." Ask the jeweler how they grade the cut of their diamonds. Next, ask them to qualify the grade they have given it. If the jeweler is only using the table and depth percentages for evaluating the cut, they have misrepresented the cut grade to the consumer. Ask the jeweler to show you three to four diamonds side by side. Most jewelers will refuse to do this because they know you will see too many inconsistencies in how they have evaluated the cut. Ask the jeweler it they have the proper gemological equipment to evaluate the cut of their diamonds. They must have a BrillianceScope and a Megascope to accurately grade the cut of a diamond. Next, ask the jeweler to show you the reports from these computers. Without these two state-of-the-art computers they are only guessing at the cut grade. 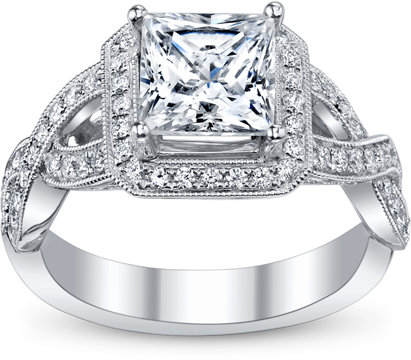 At Arthur's, we have the only state-of-the-art diamond grading lab in the state of Minnesota which allows us to accurately grade our diamonds. We allow the consumer to compare many loose diamonds side by side to properly see cut differences. The cut of a round diamond is graded on a scale of 0 through 10. "0" represents an ideal cut, and "10" represents a poor cut. The average diamond sold in the market place today ranges from 7-10 on the cut scale. Remember, 95% of diamonds are cut for weight retention and not for the beauty of the stone. The three categories that are taken into consideration when grading cut are: Proportions (the dimensions of the diamond), Symmetry (how the facets are aligned within the proportions of the diamond), and Polish (the finishing touches to the surface of the diamond). The diamond's overall cut grade is based on the lowest score it receives in all three categories. It is a common misconception that a diamond which has an ideal table and depth is then automatically an ideal cut. Yet these are merely two of ten measurements that determine a diamonds cut grade. Many poorly cut diamonds actually have an ideal table and depth, but when the complete measurements are considered the cut grade is poor (7-10). Many jewelers only feature GIA (Gemological Institute of America) certified diamonds for this reason. GIA only asses: table, depth, girdle thickness and culet. This offers an often misleading snapshot of the whole, highlighting only the diamonds strengths without presenting the entire picture. This can lead the consumer into buying a diamond that is less valuable and less beautiful than the cut grade that was suggested by the jeweler. Arthur's is one of a few stores in the United States and the only store in Minnesota with a complete diamond grading lab. We have invested in the latest state-of-the-art diamond grading computers to accurately grade our diamonds. Most jewelers rely on their eyes and imprecise tools to measure their diamonds, which can lead to the improper grading of their diamonds. At Arthur's, we use the OGI Megascope. 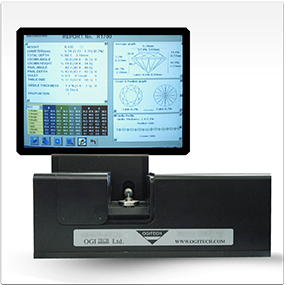 The Megascope is a computerized proportion analyzer that accurately measures a diamond and is able to precisely assess the cut grade. Most jewelers only use a simple millimeter gage to evaluate the dimensions of their diamonds. The Megascope takes 144 pictures of every diamond. 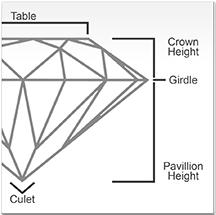 While photographing the diamond it measures: the weight, diameter, crown angle and height, pavilion angle and depth, culet size, table size, total depth, girdle thickness, and symmetry of the diamond. The Megascope measures all 58 facets of the diamond and symmetry providing the overall cut grade of the diamond (0-10). This insures we are 100% accurate in our grading.